Freezing peppers from your garden or the farmers market is easy! This is the best money I’ve spent all month!! Yellow and red peppers at the farmers market are $.50 each right now. Organic red peppers in January will cost $5 each. There’s no doubt about it – a red pepper at the peak of the season tastes nothing like its waxy, dull tasting, unnatural looking cousin sitting on the shelf in January. And they’re way easier on the wallet during the booming summer harvest months. It’s such a pleasure to cook in summer with food that’s fresh from the garden or market. Meals come together easily because all you need to do is highlight and augment the amazing taste of the featured vegetables. With a little extra work in summer and fall that kind of cooking is within your reach all year round. You can appreciate the abundance of the season while it’s here, and also save some for later. Preserved food makes cooking in the winter so much more fun…and tasty! 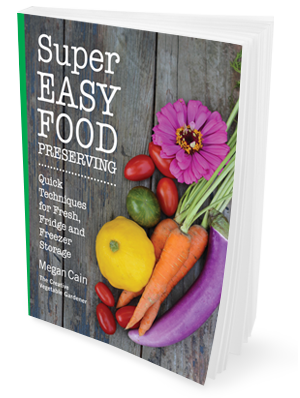 Get a free sample of my book, Super Easy Food Preserving, with the pepper freezing instructions. You don’t have to have fancy equipment, special knowledge, or even a big garden to be a food preserver. All you need to do is start with one thing that’s coming out of your garden or is abundant at the farmers market. 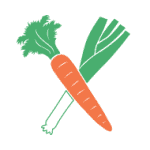 Pick a vegetable you eat a lot of during the off season and set a goal to put some away for later use. Believe me, you will be ecstatic to pull red peppers out of your freezer on a gloomy winter day and use them to cook up a delicious meal for your family. You’ll feel like you somehow cheated the system! You can use these directions to freeze any kind of pepper – sweet or hot. I’d suggest storing them in separate, well-labeled containers. Prep Materials Needed: Cutting board, knife. Best Storage Containers: Freezer bags or glass canning jars. 2. Chop into desired bite-sized pieces. 3. Peppers can be frozen raw so simply pack them into containers. 4. If the peppers are dry when frozen they shouldn’t stick together. If you want to make sure they remain loose, spread them on a cookie sheet for an hour in the freezer and then pack them into containers. How to Use Them: Beans and rice, casseroles, pizza, stir frys, soups, other ideas here. Get a free sample of my book, Super Easy Food Preserving, with the printable pepper freezing instructions. Cooking a January meal with peppers, broccoli, onions and garlic all from my pantry. If it’s pepper harvest time in your area right now, take a trip to the farmers market and load up a bag full of peppers of all colors of the rainbow and squirrel them away for those winter meals! Want more quick and easy ideas for preserving food? 3 Easy Ways to Preserve Tomatoes: No Canning Involved! Hi Lynn- I teach about what I do at home and I don’t tend to like dehydrating. It requires an investment in equipment and I think it’s too much work. It is a great way to preserve food though! Free sample of Super Easy Food Preserving with the pepper freezing directions!